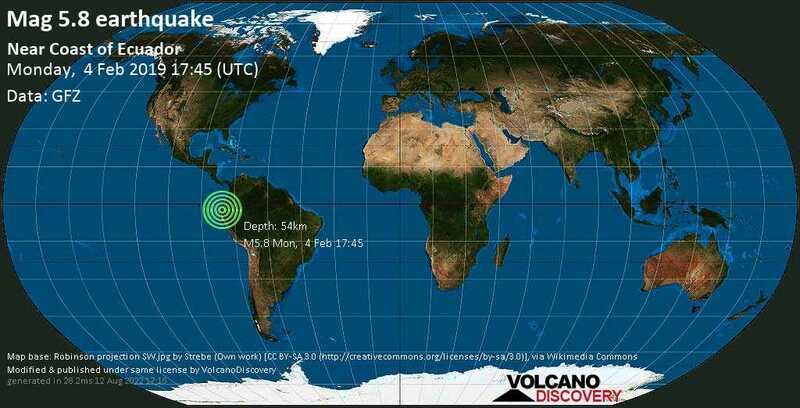 Feb 4 17:58: Magnitude recalculated from 5.6 to 5.4. Hypocenter depth recalculated from 10.0 to 99.0 km. Hypocenter depth recalculated from 99.0 to 64.0 km. Feb 4 19:36: Magnitude recalculated from 5.4 to 5.8. Hypocenter depth recalculated from 64.0 to 54.0 km. Montanita / MMI IV (Light shaking): I felt two bumps a second apart followed by light shaking for a few seconds. We ran outside as did several others. Cuenca / MMI VI (Strong shaking): I felt the quake, noticed my hanging clothes shook a lot. I was afraid but the building shows no damage. I also felt the one early this morning but less so. Cuenca / MMI V (Moderate shaking): On second Floor of house. This lasted a long time- maybe 30 seconds and for Cuenca was strong enough. Cuenca (106.9 km ESE from epicenter) [Map] / MMI IV (Light shaking): I was sitting at the computer indoors and felt the main shock for a couple of seconds, then about 5 seconds later, an aftershock was felt. Cuenca, Ecuador, tres Puentes sectir / MMI IV (Light shaking): It lasted about 15 seconds. The walls shook and the windows rattled. Cuenca, Azuay, Ecuador / MMI III (Weak shaking): Sitting in my house in Cuenca. There was the main wave for a couple of seconds then about 10 seconds later, there was a smaller aftershock. Zamora Ecuador (180 km SE from epicenter) [Map] / MMI IV (Light shaking): I was in my 3rd floor room in the Hotel Betania in Zamora Ecuador around 12:50 PM when the room very noticeably started to shake with a side to side motion, lasting only a few seconds. I left the hotel and waited outside for a few minutes and felt no shaking out there, so returned to my room. No activity since and no damage that I can see. Cuenca, Ecuador / MMI VI (Strong shaking): I live in Cuenca, Ecuador and felt two very strong shakes...rattled windows...floors shook..dogs barked. I ran outside with my neighbors. No seen damage in the house. Crucita Ecuador / MMI II (Very weak shaking): We are in a 4th floor condo and felt minor shaking. longwood, fl (3467.1 km N from epicenter) [Map] / MMI III (Weak shaking): Heard the building shake and a couple of the windows rattle 3 times in ~3-5 minutes. (116.4 km WNW from epicenter) [Map] / MMI V (Moderate shaking): Books fell off the shelf and house was shaking. Cuenca (181 km SE from epicenter) [Map] / MMI IV (Light shaking): Felt as though a heavy giant taking heavy stamping steps was jumping in the building. No trucks were passing. Lasted seconds. no damage noticed, nothing fell from shelves. vilcabamba / MMI III (Weak shaking): I was lying on a couch and the room shook for about 3 seconds. Cuenca Ecuador / MMI IV (Light shaking): Sitting at table and we felt the shaking twice. Lasted about 3 seconds each. We live in Cuenca Ecuador. Manta, Ecuador (185.2 km NNW from epicenter) [Map] / MMI II (Very weak shaking): Very weak tremors, lasted less than 10 seconds on 3rd floor of three story concrete brick apt bldg. Riobamba / MMI IV (Light shaking): Windows rattled for about 20 seconds. Quito Marriot hotel / MMI IV (Light shaking): On 6th floor of Quito hotel & things started to move. Wall phone cable swung for over a minute. Water in basin & toilet moved from side to side. Cuenca, Ecuador / MMI IV (Light shaking): Inside a house. Shaking lasted about 30 seconds. Rattled doors, windows. Santo Domingo, Santo Domingo de las Tsachilas / MMI IV (Light shaking): Windows rattled for a while. Dog's were barking. Cuenca, Ecuador -- third floor of house / MMI IV (Light shaking): Third floor of house shook but only for two seconds. I immediately left the house. Canoa Manabi main street / MMI IV (Light shaking): Street pelectricity posts and cables were moving for less than 1 minute. Cuenca, Ecuador / MMI IV (Light shaking): Two waves, seconds apart. The first wave was milder than the second. Total duration about20 seconds. Cuenca, Ecuador / MMI VI (Strong shaking): we don't usually feel these but this was almost like 2 with a few seconds between. Cuenca, Ecuador / MMI VI (Strong shaking): Things fell, chandeliers swinging, longer than usual, very scary.